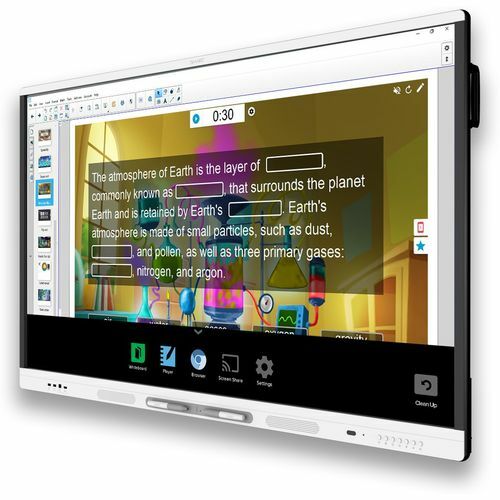 SMART Board MX series 65" Interactive digital Panel Includes iQ technology which is an embedded computer enabling instant whiteboarding, easy wireless screen sharing with the built-in web browser. Includes a SMART Mounting bracket made exclusively for this range. SMART Learning Suite Software - combines lesson delivery, assessment, student collaboration and game based activities. It connects students, teachers and devices to turn lessons into enriching learning experiences. 1 years subscription included. Screen Sharing - Share everything from any Android, iOS and Windows device wirelessly, without plugging in hardware or installing apps. Web browser - Explore websites and YouTube videos right at the board with the integrated Chromium web browser. Digital whiteboard - Pick up either of the two pens from the magnetic tray and start writing on the panoramic whiteboard. Share everything you write as you go with up to 250 devices located anywhere. Students can write back too. When you are finished, easily save your notes to the display and send them to students as PDF files. Flexible connectivity - Connect computers and storage media through the displays numerous HDMi, VGA, USB and multimedia ports. Front facing convenience ports also provide easy access to essential ports. 4K Ultra HD resolution makes every lesson crystal clear. Simultaneous Tool Differentiation lets multiple students use pens, erasers and fingertips at the same time. It frees students to work together. 10 simultaneous touch points. Commercial grade - MX series is rated for 50,000 hours of reliable use. SMARTs Accelerated Life Testing ensures less downtime and longer life.